This Montserrat Afternoon Tour is a great option for travelers with limited time in Montserrat. You’ll take the stress out of organizing transport by having door-to-door transfers included. Traveling in a small-group means a more personalized experience. Your guide will take you to Montserrat Mountain during the afternoon when it's less crowded. 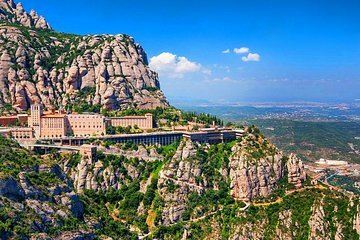 Highlights include the Benedictine monastery of Santa Maria de Montserrat, the Basilica, and the Holy Cave. We made this an afternoon tour as we did not want anything in the morning due to jet lag from our long flight which turned out to be the right move. Although we were booked as a semi-private tour we ended up being the only ones. Our guide Reuben was very personable and informative regarding our tour and gave us ample time to look around, take pictures, etc. there were other tourist there but it did not seem crowded. I do not know if it was because it was the afternoon our or not but made it more enjoyable.